Hotel lobbies are the launching pad for many fond memories, but they rarely hold cherished memories themselves, unless they have free coffee until 10am and you totally got your hands on the business section. Go Asian markets, go! For a meal to remember in a lobby worth looking back on, Deca Restaurant and Bar. Setting up shop in the 12th floor lobby of the Ritz-Carlton replete with floor-to-ceiling windows and an illuminated fountain, Deca's offering a reasonable-for-the-Ritz brasserie menu amidst sumptuous interior notes like white leather high-backed chairs and easily modified zone lighting at each table, a convenient touch for those whose best light is none whatsoever. 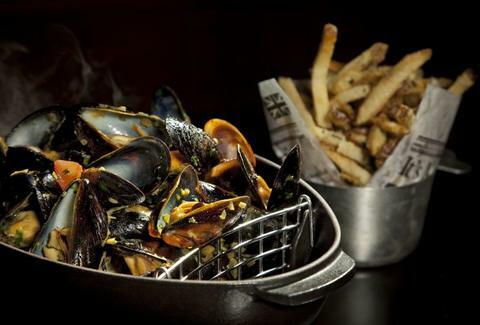 The offerings start with goodness like steamed mussels w/ a bucket of frites, leeks vinaigrette w/ Fourme D'Ambert blue cheese and caramelized walnuts, and a tower of dipping sauce-kicked Fruits de Mer, which is French for Fruit of the Sea...so probably just call it "Freedom Seafood". Entree action includes both sandwiches (a classic Croque Madame, a char-grilled Wagyu burger) and plate-ier action of Mediterranean roasted sea bass w/ clams, and broccoli rabe'd trofie pasta, which used it's looks to land an older, wealthier pasta. More than half of their 80-plus bottle wine list is available by the glass, and they're offering those glasses up for half-price Sunday through Thursday (with dinner purchase) all the way through Labor Day, a deal that'll prove that just because a meal's worth remembering doesn't mean you'll be able to.